A weekly space for The A.V Club’s film critics and readers to share their thoughts, observations, and opinions on movies new and old. At the risk of stating the obvious, film critics watch a lot of movies—more than any of us write about, anyway. Here at The A.V. Club, almost all of the writing we do about film falls in two categories: reviews and long essays, the latter filed either under recurring features (like Palme Thursday, Scenic Routes, or Run The Series) or For Our Consideration. So, we’ve decided to create a more informal, bloglike (remember those?) space where we can share thoughts, observations, and opinions on movies new and old in the first-person singular. These might be movies we’ve seen for fun or research or new releases we weren’t assigned to review. Commenters can feel free to also use this space as an open thread. This past weekend, I saw the 1960 Romanian film Reconstituirea (translated as Reconstruction, but more accurately Reenactment), which is one of the more bizarre documents of 20th-century totalitarianism. This is a Z-grade docudrama—not much more sophisticated than the exploitation cheapies that were being made around that time by Doris Wishman or the recently departed Herschell Gordon Lewis—in which a group of alleged armored car robbers reenacted their heist shortly before all but one of them was executed. It’s believed that the so-called Ioanid Gang agreed because they were led to believe that their sentences would be commuted in exchange. Watching these condemned men (and one woman, who got a life sentence) act out the planning of the crime in their own drab, under-furnished apartments is innately creepy. But there’s also good reason to believe that the version of events presented here was mostly a party fiction and that the holdup may have never happened at all. At the time, stealing a large amount of money in Romania was basically useless, and the proof of Western decadence presented in the film (including a single Yma Sumac record that keeps finding its way into the frame) is so ersatz as to be poignant. I found myself thinking a lot about both shoestring scare flicks and staged reenactments this week. Preparing the next edition of The Overlook (on the evangelical favorite A Thief In The Night) put my mind on the former, while reviewing the inane Passage To Mars put me on the path to the latter. While writing the review, I rewatched a couple of scenes from Jacques Cousteau’s 1964 classic World Without Sun, which is so irresistible that I later ended up just rewatching the whole thing. Cousteau’s sense for the eeriness and strangeness of nature is unparalleled (it’s a damn-pretty-looking movie), as is his cavalier attitude to both documentary reality and scientific fact. As critics have pointed out for decades, you learn basically nothing about Conshelf II, the undersea lab that’s the nominal subject of World Without Sun. But the film oozes personality and charm. I’d completely forgotten how spot-on Wes Anderson’s The Life Aquatic With Steve Zissou is in nailing its blasé quirkiness, boys-adventure camaraderie, and useless technologies. (See: The videophone designed so Conshelf II’s crew can coordinate meal plans with Mrs. Cousteau.) 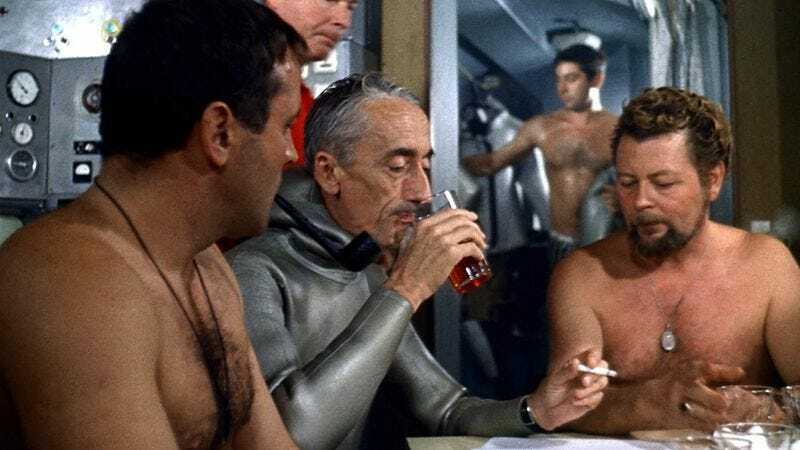 Also, I am inexplicably endeared by the emphasis Cousteau puts on his team’s incessant smoking, including a shot where a diver enters the Conshelf II through its moon pool and is immediately handed a lit pipe. One of the facts Cousteau opts to include in his narration is that, in their submarine habitat’s oxygen-rich atmosphere, cigarettes burn twice as quickly. Like my colleague A.A. Dowd (who’ll be joining me on future entries), I also saw Tim Burton’s new film Miss Peregrine’s Home For Peculiar Children, though I’m going to hold off talking about it here until next week.